As I prepared to write this week's Etsy Twitter Team's Shop of the Week, I found myself just mesmerized by all the items that our Shop, Glitzy Events has available. Shop owner, Kim Williams, specializes in Custom Invitations for Weddings - and the choices are just so amazing; if I were a bride I wouldn't know where to start!! But you will see, as you browse Kim's shop - she has offers so much MORE than just invitations. 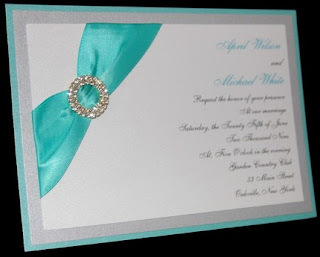 Of course, women and NOW the men who want to please them, all recognize this wonderful aqua color use for "Tiffany's" and here's just a wonderful use of that combination of Aqua/Silver/and White joined together to have your own affordable "Tiffany" style affair, with Kim's creation, The Charming 7x5 Layered Wedding Invitation. Kim says, "Glitzy Events was created to give brides a creative and affordable alternative for wedding invitations. We specialize in pocketfold invitations, but we can create just about any invitation that you'd like!" Well Kim, I have to say, I'm sold on this one already!! 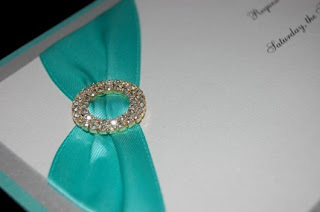 You know, I'm a girl of BLING and I went DIRECTLY to this wonderful invitation! Just check out the detail (photo below) of the affordable, classy touch of charm. This and so much more is featured on Etsy Twitter Team's Blog of Glitzy Events; where you can learn so much more about this creative shoppe owner. Also, check out previous articles on other team members, as well. You'll find we are a diverse group of artists who just love both tweeting and creating. 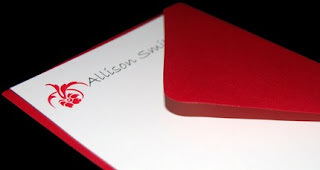 Kim also has created these fabulous Custom Note Cards that are just such a Special Item in my own heart. Not only are these Custom Cards a wonderful gift for the Bride & Groom to be, they are just a terrific idea for the young lady turning Sweet 16. I know she's texting you right now to borrow the car tonight; but one day, she'll see these cards tucked away and remember the days she was young. 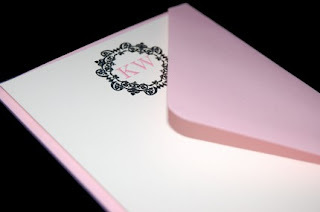 The Kara Custom Set of 15 Flat (Fifteen) Note Cards (above), are just as sweet as they can be and can fit any occasion; Babysitter Birthday Gift, Graduation, or even just a wonderful item to send off to a favorite friend. especially something that is created and made with love. The Allison Custom Set of 10 Flat (Ten) Note Cards (photo, above) is just the perfect gift for your sweetheart or best pal this Valentine's Day! or convo her ahead of time for an updated listing.